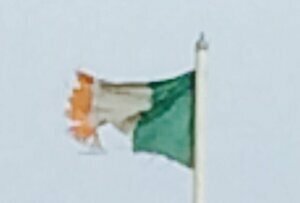 Posted in Misc and tagged Clery's, Colm Coyne, Irish flag at 9:19 am on October 17, 2016 by Broadsheet. The consortium that bought the Clerys store in Dublin for €29 million is trying to lure Apple to open a flagship retail outlet on the ground floor of the site. It is understood the Natrium consortium, fronted by D2 Private developer Deirdre Foley, has held numerous discussions with Apple over several months. …Meanwhile, the Government will on Friday submit a new batch of documents to the European Commission’s investigation into Apple’s tax arrangements in Ireland. The Department of Finance confirmed yesterday that the commisison has requested extra documents. 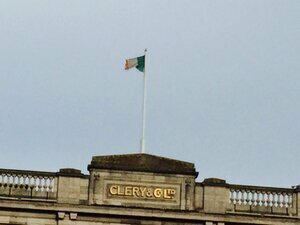 Posted in Misc and tagged apple, Clery's, O'Connell Street at 9:44 am on April 22, 2016 by Broadsheet. 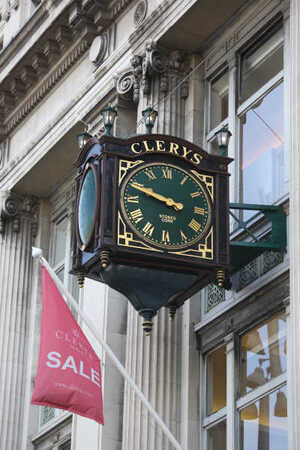 Last night RTÉ One broadcast an hour-long documentary, by Judy Kelly, about the closure of Clerys last year with the loss of 460 jobs. 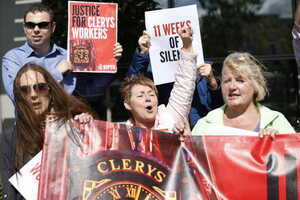 It included interviews with former employees, such as Maurice Bracken, who had worked at Clerys for 32 years. 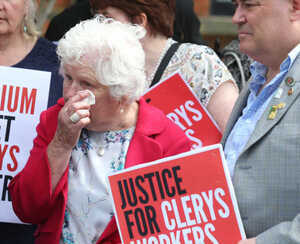 Bracken and the other workers – some of whom worked over 40 years at Clerys – only got the statutory redundancy of two weeks’ pay per year of service. 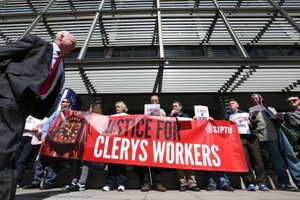 The documentary highlighted how many of the workers felt the Clerys building on Dublin O’Connell’s street should have been sold in order to offer better redundancies. 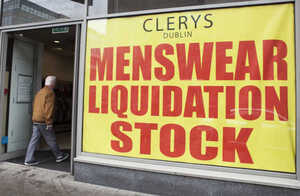 But it explained that in 2012, the owners of Clerys, Gordon Brothers, split Clerys into two companies – a trading company, OCS Operations, and a property company, OCS Properties. OCS Operations paid rent under a lease to OCS Properties for the use of the building. Within two and a half years, OCS Operations, which employed the staff and managed the department store, made a loss of €4.3million. 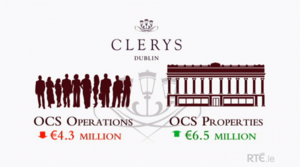 Meanwhile, OCS Properties – which has no staff – made a profit of €6.5million. 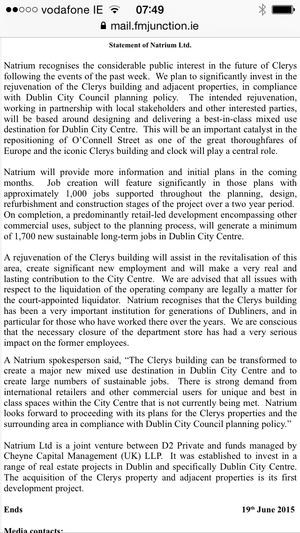 As the trading company’s lease had expired three months previous, Mr Brydie – a former director of Anglo Irish Bank in the UK – wrote to Natrium asking it to extend his lease but they wrote back immediately saying they’d send a formal notice to quit if he didn’t get out of the building. 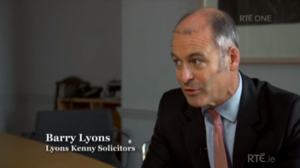 Mr Bracken, and another former employee, visited insolvency solicitor Barry Lyons to get a greater understanding of what happened. 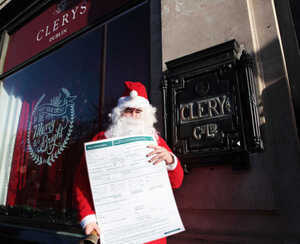 Mr Lyons had no involvement in the closure of Clerys. Barry Lyons: “There’s no doubt in my view that it was completely choreographed but at the end of the day, there is a fundamental inevitability about this taking place. The trade is declining, losses are wracking up. Overtime, somebody says, ‘we’ve got to pull the plug’. We’ve got to take a view. Posted in Misc and tagged Clery's, closure, documentary at 12:01 pm on January 5, 2016 by Broadsheet. 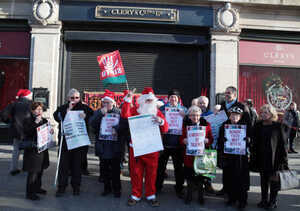 Gerry Markey who worked in Clerys for 34 years as Father Christmas joined fellow sacked workers to highlight the demand for a meeting with the store’s new owners (naughty list, above) to discuss Clerys purchase and its consequences. 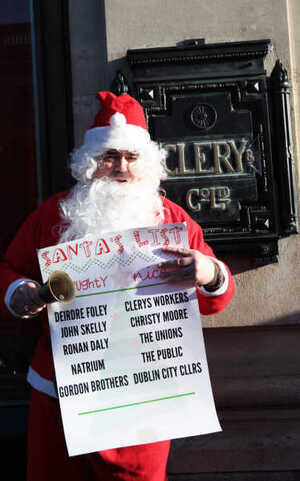 Posted in Misc and tagged Clery's, Santa at 2:56 pm on December 8, 2015 by Broadsheet. Posted in Misc and tagged Clery's at 3:32 pm on December 3, 2015 by Broadsheet. 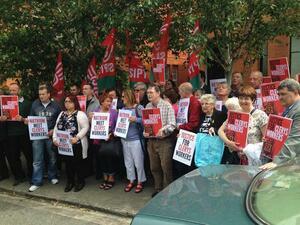 A protest against the ongoing silence of Natrium, the owners of Clerys, over the sacking of 460 workers in June. The department store liquidation will cost the State €2.5m in workers’ statutory redundancy entitlements. Posted in Misc and tagged Clery's, Natrium at 5:00 pm on August 28, 2015 by Broadsheet. 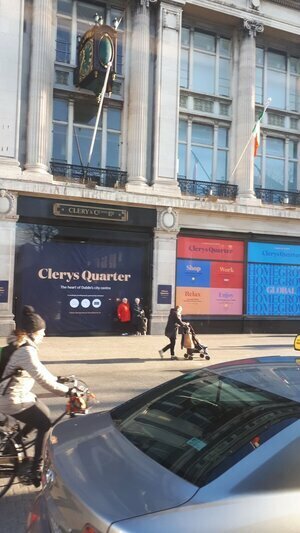 Possible Sil Fox sighting at Clerys, O’Connell Street, Dublin. Who’s for the last of the golf fleeces/galoshers? Posted in Misc and tagged Clery's at 2:25 pm on July 13, 2015 by Broadsheet. 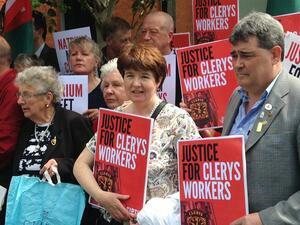 Clerys workers stage protest outside office of new owner Natrium. Caroline and her husband [bottom pic]met in the store in 1985…. Earlier: What About The Lost Jobs? 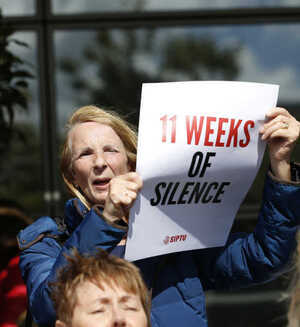 Posted in Misc and tagged Clery's, Natrium, protest at 1:21 pm on June 19, 2015 by Broadsheet.